Resale of Returned Lemons Is Restricted in Virginia | The Consumer Law Group, P.C. The manufacturer or dealer has made three or more attempts to repair the same issue. The manufacturer or dealer has made one or more repair attempts to fix a serious safety defect. In a single year, the vehicle was out of service due to repairs for a total of 30 calendar days or more. A vehicle meeting one of these requirements can be returned to the dealer for a full refund of the purchase or lease price. What happens to that vehicle after being returned? Believe it or not, it can legally be sold to a consumer or transferred to another dealership. However, important restrictions apply. It then becomes the responsibility of the dealer to disclose this information to a prospective buyer or lessee prior to the purchase or lease of the vehicle. If the dealer transfers the vehicle to another dealership, he must disclose the information as well. However, his obligation ends with the first sale or transfer of the vehicle. Problems arise when returned lemons are transferred to dealerships out of state as it is harder to monitor and regulate cross-state transfers. Unsuspecting consumers may be purchasing cars that were returned as lemons in other states and have no knowledge of the defects, even if they are dangerous. Whenever a consumer is considering buying a used car, he should confirm the car’s repair history through the Vehicle Identification Number. Multiple repairs could indicate that the car was a returned lemon. 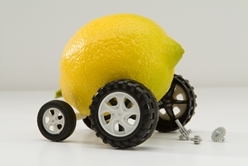 If you suspect you were sold a returned lemon without receiving a disclosure stating this fact, you may be able to take legal action against the dealership or manufacturer. Fill out the contact form on this page to get us started reviewing your case.